Lal Bagh is a 240-acre (971,000 sq.m. - almost 1 km².) 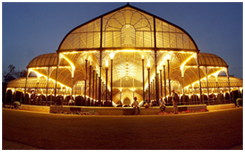 garden and is located in south Bangalore.Lal Bagh remains open daily from 6:00 a.m. to 7:00 p.m. throughout the year. or the benefit of joggers, tourists and fitness enthusiasts, entry is free from 6:00 a.m. to 9:00 a.m. and from 6:00 p.m. to 7:00 p.m. At other times, a fee of Rs.10/- is charged. Bengaluru Palace, a palace located in Bengaluru, India, was built by Rev. Garrett, who was the first Principal of the Central High School in Bangalore, now known as Central College. The construction of the palace was started in 1862 and completed in 1944. In 1884, it was bought by the then Maharaja of Mysore HHChamarajendra Wadiyar. An imposing edifice housing the State Legislature and the Secretariat of Karnataka, this is one of the best known landmarks of Bangalore. Overlooking Vidhana Soudha is this red brick and stone building in the Graeco-Roman style of architecture.